Boyton Methodist Chapel | Launceston Then! Like other areas in Cornwall during the early 19th century, the preachings of John Wesley and the like won over a large proportion of Boyton’s population. At first the gatherings took place in small cottages but as this led to a more formalised worship from 1835, the services moved to a barn, and then in 1842 to the first purpose built chapel, on land that was part of Dorset Park and the present site of today’s building. 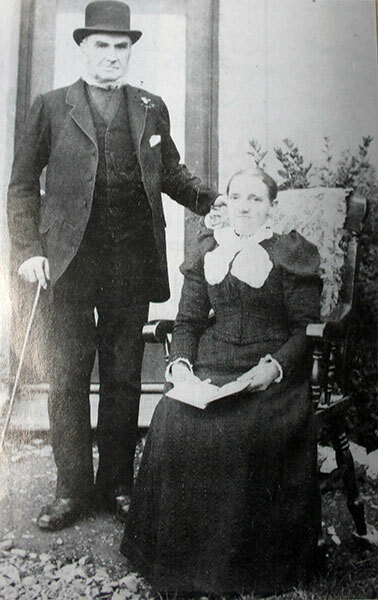 The farm was part of the Duchy of Cornwall and it was the leaseholder, Richard Gubbin that would play a significant part in the fledgling Society serving for over 20 years as superintendent of the Sunday School. 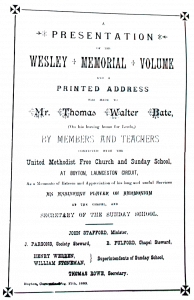 Welsh and Yorkshire reformers helped form the Wesleyan Methodist Association and it is this movement that the Boyton Society joined. At that time it was part of the Camelford and Wadebridge Circuit of the Wesleyan Association, but within three years this area was divided and it passed over to the newly formed Launceston and Stratton Circuit. Trustee Richard Smith and his wife. The plan drawn up by Charles Wise involved building the new Chapel adjoining the old Chapel, with a part of the old building was to be incorporated as a Sunday School, and also to provide extra room to the sanctuary by removable partion’s when needed. At the same time a new classroom and coach house were to be added on the end of the old Chapel. Four Memorial Stones were laid, with two by members of the Gubbin family to the memory of the last two generations, which included Francis, John and Richard Gubbin, all of whom played a major role in establishing the Movement at Boyton. A stone to the memory of John Giddy, of North Beer was laid by Thomas Rowe and the final stone was laid by a Miss Downing in memory of her father, John Downing. In addition to the Memorial stones, 40 Memorial bricks were also laid. The construction took just 6 months to complete and the official opening took place in July 19th, 1889. However, within four years the new Chapel was in need of some remedial attention to deal with dampness of the ‘Dorset end wall’ and other general repairs. In 1902 a new wood ceiling was put in the porch in 1902. In 1907 a merger between the ‘United Methodist Free Churches’ and the ‘Bible Christians,’ brought about the ‘United Methodist Church’ circuit of 19 chapels. 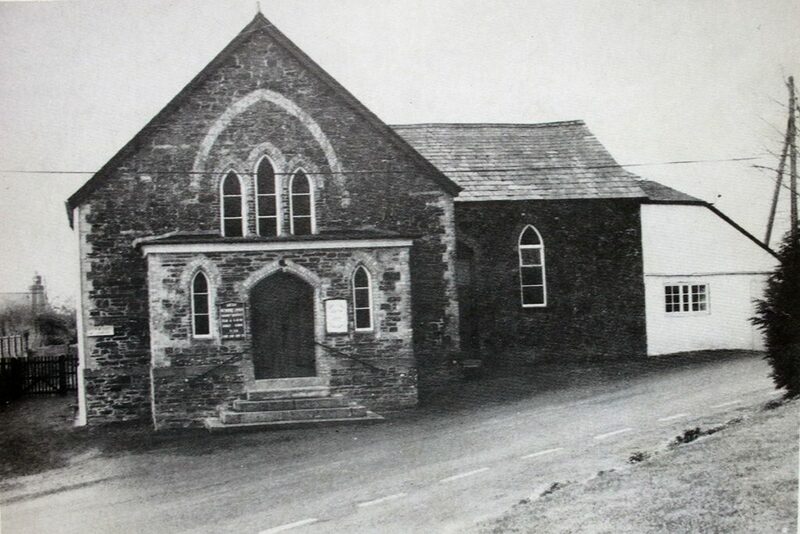 This circuit survived for another 25 years, when, another merger, this time with the Wesleyan’s formed an even larger Launceston Circuit in the ‘Methodist Church,’ with 35 chapels. 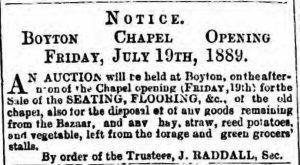 Boyton Chapel refurbishment August 13th, 1910. In 1947, Mr. F. T. Martin, of Launceston, fitted electric lighting, being the only chapel in the area to have fluorescent lighting. During it’s life the only major structural change to the Chapel came during the late 1940’s, with a permanent raised platform using the redundant choir seats from the Chapel at St. Thomas Road, Launceston, that had closed in 1946. These were erected by Mr. R. L. Fry, on either side of the preacher, and the pulpit being brought forward by a few feet, linking the two sides. In 1957, a large adjoining car park on land conveyed by the Strout family of Dorset Farm, was constructed. In the Chapel’s centenary year of 1989, the old coach house/stable block were converted to provide a modern kitchen and at the same time the toilets were refurbished. It was again refurnished in 2007 with disabled access being made. Today the Chapel forms part of the ‘Launceston Area Methodist Circuit‘ which covers 13 parishes.